View a large preview of the artwork here. Building on the success of our Wanderer’s Exploration of the English Lake District and 100 Greatest Cycling Climbs series of artworks, we have teamed up with the Campaign for Real Ale (CAMRA) to create a piece of conceptual data-art based on their hugely popular book, Britain’s Best Real Heritage Pubs – Pub Interiors of Outstanding Historic Interest, by Geoff Brandwood. Genuine historic pub interiors are now few and far between as most pubs have been substantially refitted since the 1960s. A project to identify, record and seek preservation of what is left was initiated by CAMRA at the end of the 1980s. The resulting list – The National Inventory of Pub Interiors of Outstanding Historic Interest – is widely respected as definitive, and is regularly consulted by heritage professionals. The pubs are a gloriously diverse collection ranging from unspoilt rural time warps to some of the grandest pubs in the land, created in the golden age of pub-building at the end of the Victorian era. They are celebrated in CAMRA’s book – which identifies 260 examples – each fully described and illustrated. 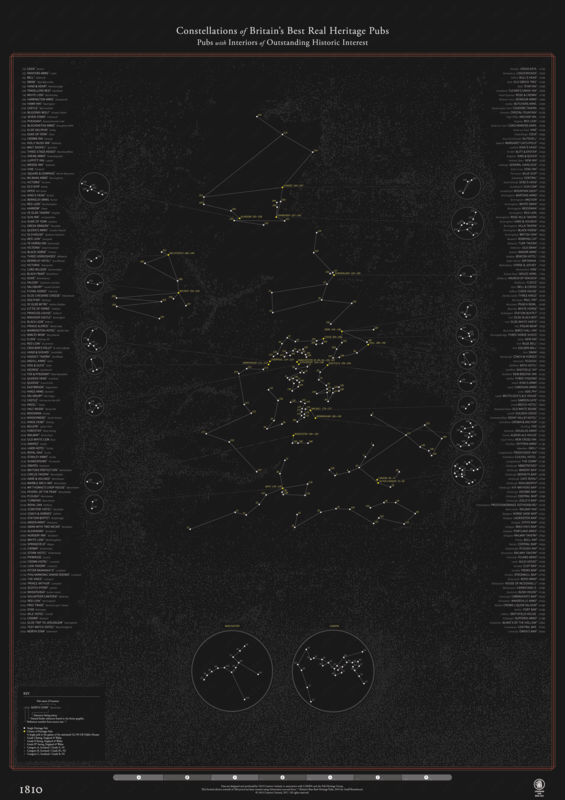 Using the pubs geographical position as a starting point, the artwork conceptualises the map of pub locations into constellations in an imaginary sky. Historically, only the best and brightest stars have been woven into known constellations, and this echoes the research and selection that Geoff and his team have undertaken. Each heritage pub is represented by a white star, while clusters of pubs in the same city are represented by a yellow star. City clusters are then shown as geographically arranged constellations in loupes down each side of the piece. The estimated total number of pubs in the UK are also represented, with each one painstakingly set by hand to form a beautiful and ethereal galaxy of 52,750 stars. The galaxy serves to provide a visual clue to the coastline of the British Isles, and their sheer weight of numbers juxtaposed against the relatively small number of heritage pubs helps to highlight the threat to our stock of historic pub interiors. There is a genuine delight in reading the names of the 260 heritage pubs listed on the piece – from familiar names such as The Red Lion and The Olde White Harte to more unique and interesting examples, such as Mr Thomas’s Chop House and Peveril of the Peak. Each pub listing also references the statutory listing where relevant, and provides a reference point for finding its location in the artwork. Printed using long-life pigment inks on DaVinci Folio Silk stock – and limited to just 500 prints – the result is a piece of quintessentially British data-art, and a fitting companion to Geoff’s book.